In 43 games with the Avalanche this season, David Aebischer has posted a 25-14-2 record. MONTREAL - Canadiens GM Bob Gainey announced Wednesday the acquisition of goaltender David Aebischer from the Colorado Avalanche in return for goaltender Jose Theodore. The 6-foot-1, 185-pound goaltender has played in 43 games with the Avalanche this season, including 42 as a starter, posting a 25-14-2 record. In 2477 minutes of play, the 28-year-old has allowed 123 goals, for a 2.98 goals-against average, and faced 1233 shots, giving him .900 save percentage. Aebischer has also recorded three shutouts, the latest coming when he stopped 24 shots in a 1-0 win over the Columbus Blue Jackets on March 2. Selected in the 6th round, 161st overall, by the Avalanche in the 1997 NHL Entry Draft, Aebischer is completing his fifth season in the National Hockey League. The Fribourg, Switzerland native has played in 174 games, including 163 as a starter. He has posted a cumulative record of 89-58-2. In 9991 minutes of play, he has given up 391 goals for a goals against average of 2.35 and faced 4605 shots, for a .915 save percentage. He has registered 13 career shutouts. A member of the Stanley-Cup winning Avalanche in the spring of 2001, Aebischer also won a bronze medal for Switzerland in the 1998 World Junior Hockey Championships. He also played for Switzerland during the 2006 Turin Winter Olympic Games and the 2002 Games in Salt Lake City. Jose Theodore was in his 10th season with the Canadiens. 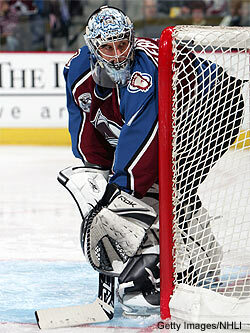 In 38 games in 2005-06, he posted a 17-15-5 record, recording a 3.46 goals-against average and .881 save percentage. The 2002 Hart and Vezina Trophy winner has been out of action since the relaunch of NHL activities with a right heel bone fracture suffered on February 16.